On Wednesday morning in Dubai, entrants for the $12 million Dubai World Cup (G1) and its rich undercard were at Meydan Racecourse on the main track, a few hours before the post position draw. In stark contrast with earlier in the week, rain fell during training hours with temperatures in the mid 70's. The races will be run Saturday evening (Saturday morning in North America), with the World Cup going to post at 9:40pm local time (1:40pm ET). In North America the full card will be broadcast live on TVG in the U.S. and HPI-TV in Canada. In addition, NBC Sports Network's show will start at 12:30pm. Here are photos and comments for 15 horses that were out Wednesday morning. Please click the smaller photos to see a larger version. Audible (Dubai World Cup) galloped twice around under Amelia Green. "He's one of these horses where it's difficult to get a handle on in the race and he can fool you in the mornings," said Jack Wolf of Starlight Racing, which co-owns Audible along with China Horse Club, WinStar Farm, Head of Plains Partners. "In the Pegasus, even though he had a little run at the end, I think he took the worst part of the track. Hopefully we can draw a line through the Pegasus and hope that he shows up. He really is a durable, hard-working horse." 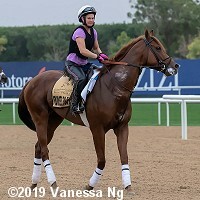 Dolkong (Dubai World Cup) cantered Wednesday morning under regular work rider Lizzie Stubbington. Connections continue to be upbeat about the 5-year-old's chances of returning home with some prize-money. "We're really happy with how he is. He's relaxed, but he's in top shape," trainer Simon Foster said. "He will have a swim before he goes back to his stable. Might just swim tomorrow and do something light on the training track on Friday. We have done everything we can do with him and he has responded every time. It would be great if he draws a good gate later this morning." 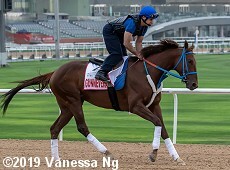 Gunnevera (Dubai World Cup) had another leg stretch around the dirt track this morning and trainer Antonio Sano's son and assistant Alex said: "He went half a lap jogging the opposite way and then did a lap and a half again - the first lap he did in a slow gallop then finished the final half in an open gallop style. "My father was here this morning (wearing gray vest) to supervise the training, he arrived last night from Miami. He's very happy to see how the horse is performing and that he travelled well. He has a lot of confidence in this year's race." 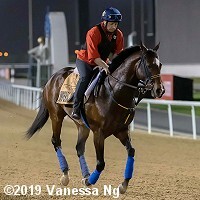 KT Brave (Dubai World Cup) was out first thing on the dirt track this morning and clocked his final breeze in preparation for the race, going 5f in 59.6, finishing up with an 11.3 final 1/8 under exercise rider Yosuke Fusano. "Upon his arrival in Dubai, he was tense and did not eat well, but once he started to settle himself into his surroundings then his appetite came back. 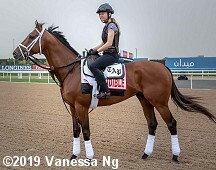 I breezed today as planned," said his trainer Haruki Sugiwaya, "His regular jockey (Yuichi Fukunaga, who will not ride him in Dubai due an engagement in Japan) has told me the dirt at Meydan will likely suit him. Based on his gallop this morning, he seems to cope with the surface well and I can agree with Yuichi. He can race on the pace or off, so hopefully he gets a good draw and gets to runs his race." 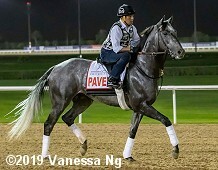 Pavel (Dubai World Cup) came onto the dirt track at 5:00 a.m, where he first walked behind the stalls and then went for a jog. Leandro Mora, Doug O'Neill's assistant, was positively beaming when he said: "I was very happy that he went out and jogged. It was a test, as he worked the day before yesterday and actually this morning it made my day as I was very happy with what I saw. I'm very pleased with it. I put Pavel through the stalls, which is just a routine. I mean, he has been through them already last year, so he knows them." 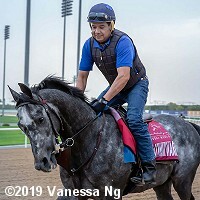 Seeking the Soul (Dubai World Cup) came out for an easy gallop under regular rider Pedro Velez and maintained the same routine he has had since arriving March 20. "He's had a lot of good days since he got here and today (Wednesday) was just another one of them," trainer Dallas Stewart said. "It got nice and cool right before he trained and he looked like he really enjoyed it. He's hitting the ground good. His attitude is great. He walked back to the barn looking happy with what he's doing." Imperial Hint (Golden Shaheen) galloped on Wednesday. "He's great," trainer Luis Carvajal Jr. said. "So far everything couldn't be better. It's been great since the day we got here. You always get nervous shipping, but I couldn't be happier." 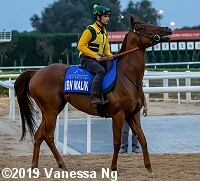 Promises Fulfilled (Golden Shaheen) emerged shortly after 7:00 a.m. under exercise rider Heather Smullen and galloped over the Meydan dirt track two days after putting in his final serious work in advance of the Golden Shaheen. "He was moving well and came back sharp," Smullen said. Trained by Dale Romans and owned by Robert Baron, Promises Fulfilled has thrived since cutting back to sprint distances following an off-the-board effort in the 2018 Kentucky Derby (G1). The chestnut colt won three of his last four starts of his sophomore campaign, including a victory in the H. Allen Jerkens Stakes (G1) at Saratoga last August 25. When he won the Phoenix Stakes (G2) at Keeneland in October, he became the only member of last year's 3-year-old male dirt division to defeat older horses in a graded stakes. Derma Louvre (UAE Derby) worked 4f in 57.0, final furlong in 12.0 on Tuesday, and came out for a jog on Wednesday. "He has settled into the new surroundings well and is an imposing horse even though he is still just a 3-year-old. I worked him this morning and my impression was the dirt should suit him, because he was able to move easily over it without issue," trainer Hirofumi Toda said. "It was a bit dark first thing this morning and there were lots of media around the turns, but he was luckily able to focus on training. I won't work him too much during the week as we prepped him well in Japan before arrival. We will just be maintaining his condition and stretching his legs." Good Curry (Godolphin Mile) galloped Wednesday. Trainer Bayram Kocakaya said, "He hadn't run for a long time before he came to Meydan and he was a bit fresh. He finished fourth and after that race we worked him a bit more and then he finished second in the Group 3, but it was a record race. The winner was great. Now he is going to step up again. It will be even stronger. We will try. We are happy with him. He was drawn 10, which is OK. He is ridden by the champion jockey in Turkey who knows him well." Ibn Malik (Godolphin Mile) comes here off a 7th place finish in the Burj Nahaar (G3) the main local prep for the Godolphin Mile. He drew post 7 and will have Tadhg O'Shea in the irons for trainer Musabbeh al Mheiri. 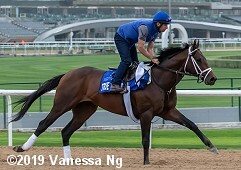 True Timber (Godolphin Mile) took to the Meydan dirt track after 7:00 a.m. for a light gallop under exercise rider Robert Massey. Assistant trainer Neal McLaughlin said, "He's settled in really well. He had a great flight over and is full of energy and eating well. The first day or two we were in the quarantine, he was ready to get out and do something. He did a gallop of about a mile and a half (2400m), just a slow canter. We're happy with the draw (three) and I think it will suit us well. There's some speed in the race, and I think we'll be stalking from a good position." 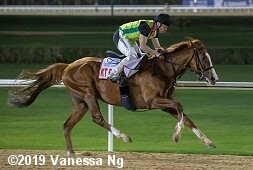 Platinum Warrior (Dubai Gold Cup) galloped Wednesday under exercise rider Javier Mesa. Trainer John Sadler said by phone from Santa Anita, "It's impossible for me to get there. Due to scheduling changes here at Santa Anita, I'm now running five horses in stakes races here this coming weekend and I've got another four in stakes the following weekend. My understanding is that he's scheduled to come back to America after the race. Hopefully, he'll be in the Breeders' Cup Turf here at Santa Anita. He's a group winner in Europe and so far he's shown himself to be a good horse." Al Zahir (Kahayla Classic) drew the rail for Saturday's Kahayla Classic. Jim Crowley gets the call for trainer Ali Rashid Al Rayhi. He comes here off a 4th place finish in the Emirates Championship (G1) at Abu Dhabi on March 15. Tallaab Al Khalediah (Kahayla Classic), defending champion of the Kahayla Classic, drew post 12. Jockey Juan Ospina will be in the irons for trainer Muosa Almasaodi.